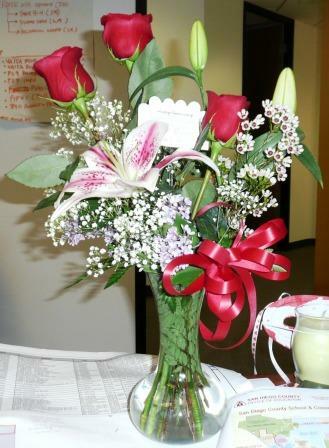 Those are my flowers (please ignore the various work documents spread across my desk) that I received Tuesday. Aren’t they pretty? 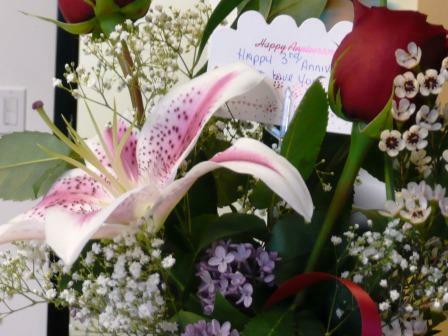 I don’t think there’s anything more fun than getting an unexpected flower delivery at work. And then you get to tell everyone who asks that your sweet boyfriend sent them to you, totally unprompted. Then you are told that your boyfriend is a) really sweet, b) really smart, c) a really good guy, or d) a keeper. And he is all of the above. Sorry, ladies. I depleted the dating pool of one of the “good guys” and I don’t plan and throwing him back in any time soon. Congrats on your 3rd anniversary! You both are so compatible and happy together. Many, many more years of this bliss.